Whey powder is a common protein supplement made by dehydrating whey, the liquid byproduct of cheese production. Skim milk powder, another milk-based protein supplement, is made by dehydrating milk after the removal of the majority of its milk fat content. While both are excellent sources of protein, the type of protein and nutritional content of whey and skim milk powders differ. The majority of the protein content of skim milk powder is casein. Otherwise known as 'slow' protein, casein is slowly released after ingestion. According to a 1997 study by Yves Boirie of Clermont Auvergne University and colleagues, this results in a moderate elevation in protein synthesis over an extended period of time, with casein also helping to prevent the breakdown of existing proteins. In contrast, whey protein is very quickly absorbed by the body. This results in a dramatic short-term increase in your body's creation of new proteins, with protein production returning to baseline within three to four hours. According to a 2008 study by Camilla Hoppe and colleagues at the University of Copenhagen, whey powder has a protein content typically between 11-14.5 percent, with a remaining 63-75 percent of its content coming from carbohydrates. Though this is true of generic whey powder, most whey protein powders are either whey protein concentrate or whey protein isolate. 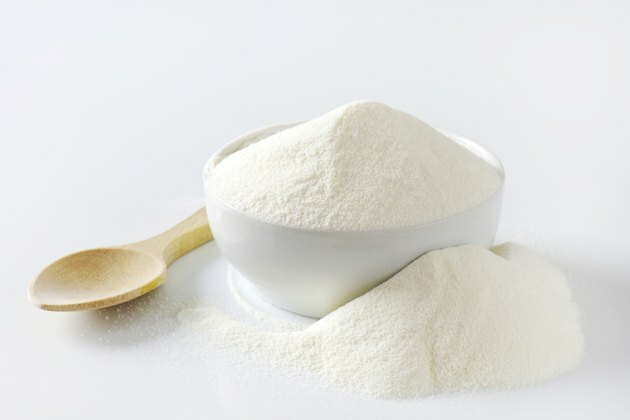 Whey protein concentrate is made by removing much of the carbohydrate, or lactose, content in whey, resulting in protein content ranging from 34 percent to 80 percent. In contrast with this removal of non-protein content, whey protein isolate is made by extracting the protein from whey, resulting in protein contents exceeding 90 percent. According to the above study by Camilla Hoppe and colleagues, skim milk powder typically contains less than 1 percent fat. Due to its very low milkfat content, skim milk powder has a very long shelf life, lasting an average of three years. Like whey protein concentrate, skim milk powder typically contains approximately 36 percent protein, with a remaining 52 percent being carbohydrates in the form of lactose. According to Dr. Jose Antonio, both skim milk and whey protein are excellent sources of a full range of amino acids and are very low in fat. As mentioned above, one of the major differences between skim milk and whey protein powders is the type of protein comprising the majority of each. While the protein in skim milk powder is over 70 percent casein and around 20 percent whey, almost all of the protein in whey powder is whey protein. Though whey protein concentrate and skim milk powder have comparable carbohydrate content, whey protein isolate has much lower carbohydrate and much higher protein content than skim milk powder. While unrelated to their nutritional content, you may wish to consider the relative price of the two types of protein supplements, with protein powders made from whey protein concentrate or isolate generally much more expensive than skim milk powder. According to Dr. Jose Antonio, 'fast' proteins like whey should be taken immediately following an intense workout. In contrast, 'slow' proteins like casein work best over a longer period of time, with protein synthesis and muscle recovery occurring more gradually than with whey protein. As such, skim milk powder may work most effectively if taken before you sleep, with the prolonged rest and 'slow' protein acting together to facilitate muscle recovery.